Viniferin diminishes the severity of endotoxin-induced ALI. (A) Representative images show H&E staining of lung sections from control (saline) and mice subjected to LPS (3 mg/kg, i.t.) for 24 hours. Mice received viniferin (0 or 120 mg/kg, i.p.) once a day for 3 consecutive days prior to LPS exposure. Scale bars: 100 μm (upper panel) and 10 μm (lower panel). 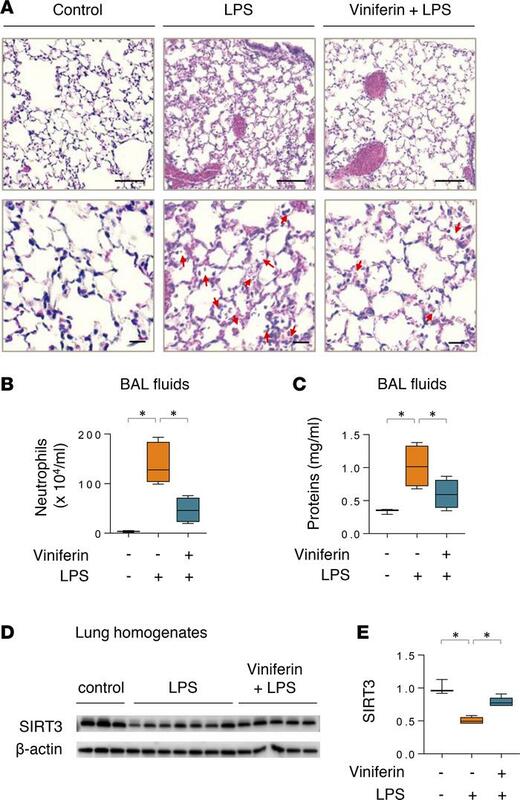 (B and C) The number of neutrophils (B) and the amount of protein (C) in BAL fluids of control, LPS alone, or viniferin- and LPS-treated mice. (D and E) Representative Western blots and quantitative analysis of SIRT3 in lung homogenates of indicated groups of mice. Data presented as mean ± SD (n = 3–7). *P < 0.05 (ANOVA).